Quote: "I am the beginning of the end. Those that defy the inevitable will be left in ruin. Come and show your defiance! I will enjoy breaking you!" This is a story of an ordinary man who lived an ordinary life. He was no one particular special; no extraordinary life, no high, important status, but an ordinary man. Jason Reed was an African-American born within an army base. His father, Cleo Reed, was just a Captain in the U.S. Army. His mother, Alisha Reed, was a simple working mother who took care of the house and worked as a clerk for a small firm. It wasn't until a few years since his birth that Cleo left the military in order to be closer to his family. They moved to a sub-urban neighborhood. However, his father was patriotic and wished to still serve the public, so he joined the police force. Cleo was gungho about getting involved and contributing to the community and it became infectious onto Jason to where he volunteered. It started off small, doing things like helping his father and his father's co-workers with community events. Life was normal, Jason went to school, earned acceptable grades, and was active in sports. He even took up martial arts at a community city near his hometown. 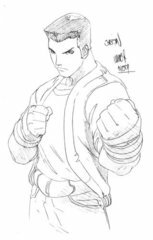 At 18, Jason reached to the rank of 'Professor', where he was able to teach kids the mixed style of capeira and jeet kune do at the community center. He completed high school and was attending a small college. Even ordinary people can display extraordinary feats. It was strange day. Creatures came out of nowhere and assaulted the district of the city. There was fear. Noone knew where they came from. Nobody even knew how, when, or how long they have been around. However, Jason wanted to protect the kids of the community city. He told them to flee. When the creatures noticed the kids, Jason was already on the move to face them. He was a simple man who was facing down strange, alien creatures. What was impressive was that he had extraordinary bravery. Unfortunately, unable to best the monsters, he was critically wounded. It gained the attention of the Organization. The aliens abducted Jason, bringing him to the Organization. 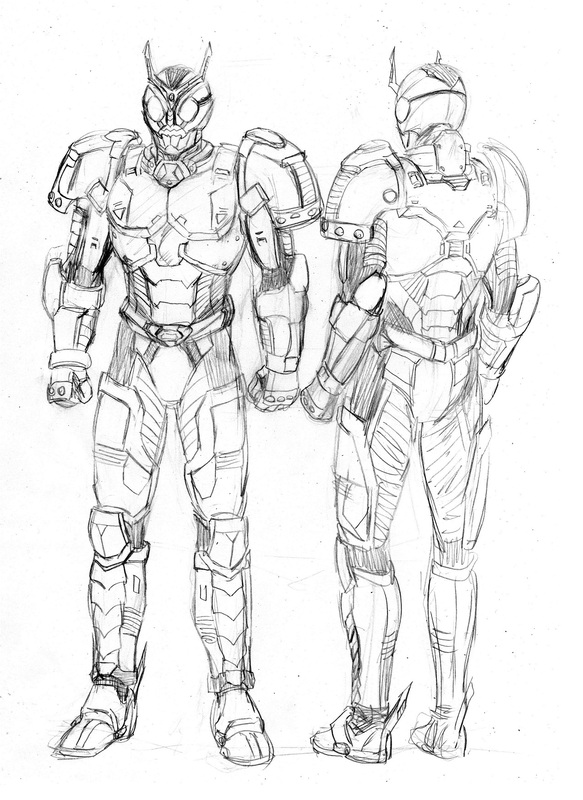 They were interested in testing a new armor for what they called the 'APOCALYPSE Project'. It was an experimental device that would allow him to transform into an armored being called the 'Exode Driver'. However, they would have to erase his memories, brainwash him, and recondition him. It was a slow process. As weak as he was, he had strong willpower. It amazed them to where they wanted to try harder. They eventually broke him. Jason Reed became one of the Riders of Apocalypse: The Horrors of War, Exode. Jason comes off as an approachable, friendly guy. He seems pretty open and comfortable with himself. He comes off as a relaxed and chill fellow, almost carefree in some aspects. While not quick to just talk to just anyone, he nevertheless does enjoy interacting with people. Expressively, he tends to be show subdued bemusement. 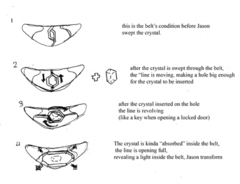 Generally, Jason seems like the type of person who would go with the flow and improvise if a situation changes. His manner of speaking is rather informal, varying slang to his words. He'll address authoritative figures the same way. While carrying respect, he has no intentions of changing from his manner of speaking unless he has to be presentable where he has to watch his speech. However, he hates having to fake a more 'formal voice' for show. His sense of humor is generally either filled with bemusement or hardy, jovial laughter. He isn't above playing practical jokes, but he tries to be creative with it, involving a friend to help him in the endeavor. True to his easygoing nature, Jason is pretty patient. Although he is not 'Zen' in the level of patience, he does know that things will come around if they do not immediately come. That portion is an important life lesson in his teachings: Patience is a virtue. His years have taught him to appreciate that development. Though, he is quick to act when the emergency calls. After all, when things become hectic, the best policy is to move with a sense of urgency. There is a paternal nature to Jason. In the large spectrum, he has a soft spot for kids, likely through understanding what many go through in trying to find their place in the world. It is why he teaches more than capoeira and jeet kune do. It reflects on his teacher aspects: it is not just the matter of teaching about the style and the way, but for a community, it is important to teach them about what they can achieve and help build their confidence. He prefers nurturing the person until they can stand on their own two feet. Jason rarely, if ever, backs down from a challenge. 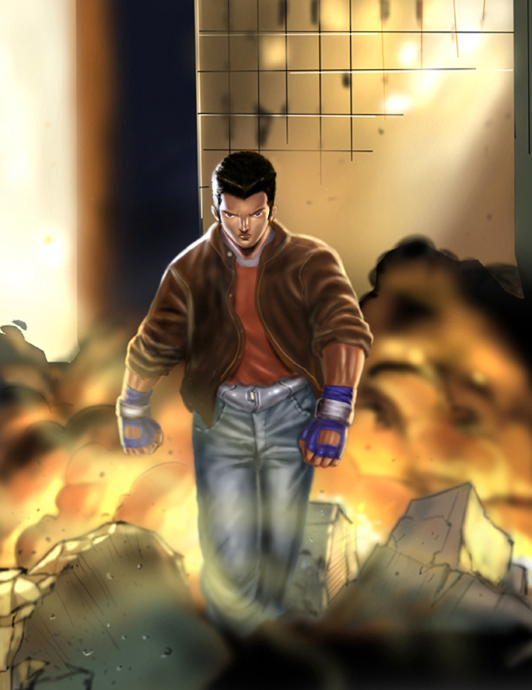 Whether sports or a fight, Jason will take up the challenge. Perhaps part of him has something to prove, but the main part of him enjoys the rivalryship behind dealing with the challenge. It puts his skills to the test against the other person and keeps him active. This may end up being a competitive streak, sometimes falling prey to the competitive mind-set, becoming cocky to some degree. Jason has no interests in being a follower, hence why he is not keen on joining the military or police. It doesn't sit well to being under someone else's orders. Instead, he prefers to follow his own orders and be his own boss. As such, he prefers to have and enjoy his life of independence. The one trait that makes him extraordinary is his bravery. He was considered just an ordinary person until he faced off against the aliens that attacked. What drove him was a sense of higher purpose than himself. In that same vein, that is what drives him to fight for others. He is serving a higher purpose: defending those who cannot defend themselves. He is able to actively take part. Overall, it has changed Jason. While he normally was the approachable, friendly guy, he became more cool and standoffish. He still manages to retain his easygoing, relaxed stance on things while in his normal form. His views upon the world as a whole are filled with insects that need to have their life filled with hardship. There is disdain for everything around him. There is always that urge to wreck things and create some sort of havoc. The brainwashing has made him more violent. Due to the mindset of being a 'Horseman of War', he represents the role through the love of causing strife and violence. There is delight in seeing people struggle, fight, and fall. While he still retains his patience, he is quick to make the first move. What is retained, if not heightened, is his competitive edge. Like most of the personality, it has twisted Jason to where he puts more in stake in the need to compete with the intentions of 'breaking' the person who dares challenge him. In fact, the challenge is to the point where it becomes an obsession. That obsession will drive him to make mistakes in order to beat or keep that challenger. It has bent Jason's independent thoughts to be subservient to the ideals of the Organization. This pushes his mind to believing that the Organization's belief is the only way that the world shall be ruled(or destroyed). There is a great deal in pride towards those who serve a higher purpose than themselves. With his father, that is why Jason looks up to him. His father was a simple man who wanted to serve his country to keep his family safe. Upon leaving the army and becoming a police officer, the intentions were the same, but geared towards the community. Because of that, Jason is inspired to help those within the community in a way that he can. While he has no intentions of serving the military force or the police force due to his independent nature, he instead volunteers his time to help teach those in the community martial arts, particularly capoeira and jeet kune do. He seeks to not only teach them the value of the style, but what they can do if they put their mind into it. Given his sense of community involvement, he makes sure that his group involve themselves in community projects ranging from car wash to fundraisers. Because of his father, he has a great deal of respect to those who serve the public whether they are officers, firefighters, or military members. It is that great deal of pride that makes him proud to be an American. With that, he is likely to volunteer his time to help those who have been affected by war, trying to recover. 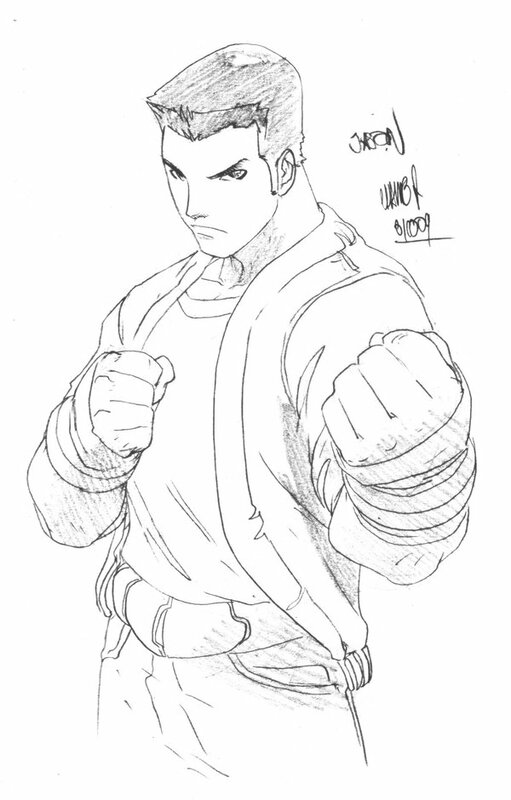 He values his martial arts as it served him well for self-defense as well as his style of mentoring others. It gives him a reach to communicate with the youth of the community. It flows with his love for music and dancing. There is only a few things that Exode values: It is what the Organization have instilled upon him. Their goal is his goal. Their value is his value. His mind had been shaped to their needs and what they want. After all, they have completely turned him into a machine of destruction. However, as the Avatar of War, his value is in the results of the havoc that is brought under his role. Seeing men, women, and children struggle in chaos is music to his ears. There is a great value in what war can bring out of people. It can bring the best or the worst in people. Only the strong survive. That is another value that is instilled. Those who can survive are strong enough to join it. There are those who are to submit to the rule, but the strong have more value. To Exode, that strength provides a challenge for him. Jason wants to continue doing something greater than himself. In a way, he feels that he is doing that through teaching the kids. However, he feels that there is something more that he can do. It is a dream that Jason hopes that something comes his way to where he can do more than he is already doing. It isn't for the glory. It isn't to be recognized. However, it is from his proud nature to his father that he aspires to do something great for his home, if not the world. Destruction. There is the goal in achieving what the Organization wants. However, after that goal is achieved, there is nothing else. After all, he is merely subservient to the whims of the Organization that stole his life, leaving an empty void. Jason loves being active, so he'll do various sports activities. He is willing to try anything once, whether it is scuba diving, sky diving, or any of the more extreme sports. Jason keeps active by playing various sports such s volleyball, basketball, and even some more obscure ones. If it helps team-building, Jason is all for it. However, his favorite sport that he is best at is mountain biking. It is the thrill of the speed and facing the elements against him. In a way, the sport is facing off against nature herself. It is a challenge that Jason seeks to overcome. This extends out to motorcycling, racing through the streets against others and against nature if it comes down to it. With Jason valuing his father's time with the army and now with the police, Jason offers to help support the community to reduce the crime. He generally supports fundraisers and community service. Those who practice under him are encouraged to participate. He even appoints someone to head it to give them a sense of leadership. There are no hobbies left. What hobbies that Jason enjoyed are wiped, if not repressed. Instead, Exode is to remain in stasis to recharge. However, there is a part that takes a walk. It is a faint reminder that brings Jason back to where he was. However, the walks feel more empty and fulfilling. During the walks, it feels that there is something missing. Though, causing destruction could count as a hobby. After all, as an Avatar of War and Violence, nothing seems more of a hobby than causing strife to people. Jason's fears are small and insignificant. This ranges to his deal with bugs, particular spiders. He can seem like a baby at times due to the creepy critters and may be able to be scared quite easily. He doesn't do well with watching horror movie either. It was likely due to watching it when he was younger and it scarred him from wanting to watch it. No fear. All fear has been removed from Jason upon becoming Exode. In a fight, Jason can be pretty cocky and taunting. However, despite the cockiness and taunting behavior, he takes the fight pretty serious. The tactics are more to get the enemy to take action against him, possibly cloud them with emotion so he can take advantage of it. However, he tends to fall prey into the emotions of battle, where tempers can flare. While trying to rely on his maneuvers, he does fall prey to wanting to exert physical power in the battle to take down his opponent. This is moreso true for Exode. The Exode mindset seeks to dominate the target at any cost. Causing collateral damage to him is acceptable, even encouraged. After all, part of war and violence is causing destruction of everything around him. Yet, he has the weakness of not finishing off the target at times, because it is the fight that drives him. If the person is dead, he is no longer able to fight the person and the value is lost. However, that only applies to the person who he considers a great fight. This is geared towards his obsession with keping the strong alive. He is not predatory, per se, but he is relentless in his actions. Martial Arts - (Jeet Kune Do/Capoeira Mix): Capoeira is considered 'dancing' martial arts while Jeet Kune Do is a hybrid martial arts-style that is direct and straight forward movements. Capoeira relies on acrobatics, feints, sweeps, kicks and headbutts. Jeet June Do, however, draws its strength on utilizing minimal movement and with maximum effect and speed through anticipating the enemy's movement and intercepting them. Jason uses a mixture of the two to keep his opponents guessing and try to blend the two for his own style. Genetic Enhancement: To ensure Jason's survivability, he had been genetically enhanced. This allows them to sustain monumental amount of damage that would otherwise be fatal to any normal person. Telekinesis: This path of psychic energy utilizes the power of the mind to manifest a devastating force. As part of the genetic enhancement, the power had been heightened with the potential of utilizing a destructive force. This is prevalent when he is not within his transformed state. The limitations behind his telekinesis is that it comes off as an uncontrolled, powerful shove. Exode Driver: This device is a experimental belt that was developed by The Organization for the APOCALYPSE Project. Jason was the recipient of the belt and the experiment to transform into Kamen Rider Exode. 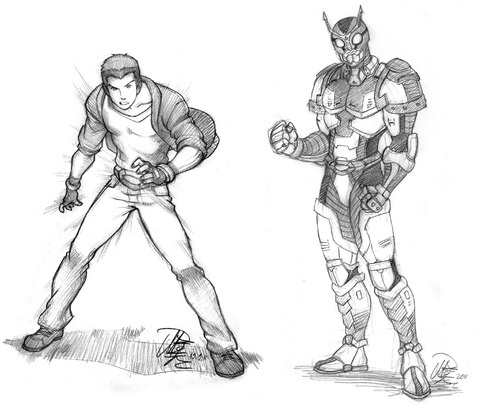 Jason Reed: In his non-transformed state, Jason is a balanced fighter. As such, he utilizes the mixture of both Jeet Kune Do and his Capoeira style. While he is slightly tactical, much of his persona has been retained that he is a bit showy in his capoeira aspects. While somewhat aggressive, he prefers to utilize maneuvers to throw off his opponent before he switches the basis of his style. This will range from spinning kicks to coming with an interceptive punch. Kamen Rider Exode: Exode is a powerhouse. Due to the Exode Armor's bulkiness, it cuts off the mobility by a significant margin. To compensate, the armor offers high protection as well as significant super strength. Within this mode, Jason is forced to apply more of his JKD techniques to achieve maximum results while using minimal movement. At the same time, his movements become more aggressive. 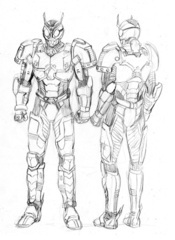 The Exode Armor has several key features in its design. 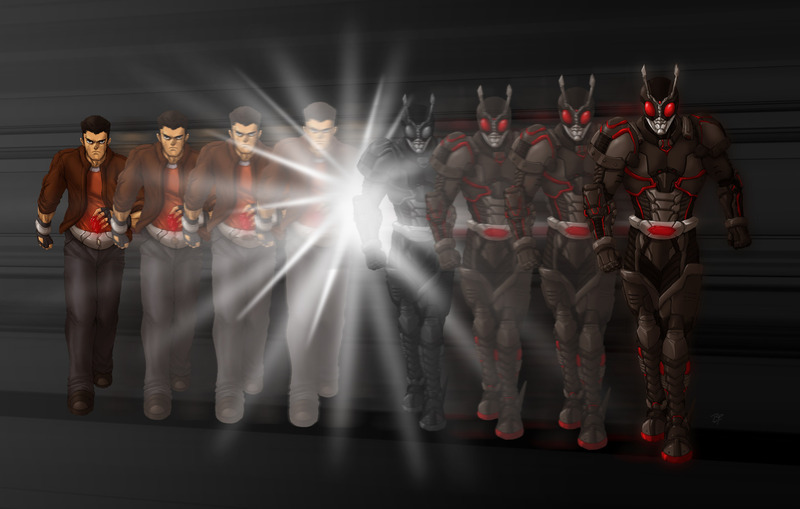 Unlike the Gear, the armor does not exist until the wearer transforms. Soul Foam/Psycho Metal: The soft parts of the armor are made of Soul Foam while the hard parts are made of Psycho Metal. It's generated by the Exode Driver to form complex machinery that is powered by the will of the user's soul. If the Foam or Metal are damaged, the armor switches off and resets itself. Global Feeler: The antenna on the Rider's head can be used as a radar or to communicate with various computer networks. Steel Heart: The chest armor provides the most protection, able to withstand light anti-tank weaponry. Crystal Scope: The visors give the Rider incredible vision. Exode's visor allows vision to see in the dark as well as calculate the direction and distance. It can sense body heat through infrared vision. Riot Visage is Kamen Rider Exode's default mode. In this mode, Exode is a juggernaut as he is granted super-strength and super-endurance. However, his movement suffers compared to other Kamen Riders. He can access his equipment this current form. Calamity Visage is the ranged, artillery-variant of the Exode Gear when fused with the Ruin Strider. The amount of power utilized to generate more energy is equivalent to his mental power as well as the willpower. While it packs a wallop, it renders him practically immovable. The Exode Driver is a transformation belt developed by the Organization. It is the prototype belt that was developed to monitor if the APOCALYPSE Project would be a success. It utilizes a Soul Gem in order to transform. 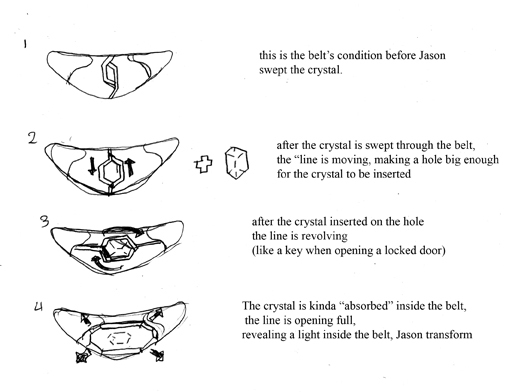 When the crystal is near, the belt's Soul Slot will open an will absorb the crystal before locking in place. It will release the energy of the Soul Reactor and the wearer is transformed into Kamen Rider Exode. The Soul Gem is a key that is a manifestation of the user's soul which enables the user to transform into Kamen Rider Exode and access all of its abilities. It manifests when the user's will is honed for a purpose. Invoked by the user's strong emotions, Exode can enter Apocalyptic Drive which greatly enhances his power and allows him to utilize his Rider Punch finisher: First Impact. The Strife-ARM is Exode's main weapon. When it is called, it manifests along Exode's right arm. It is attached through a gauge and power adaptor. When the adaptor is attached, the right arm undergoes a surge of power that allows to create a shockwave when smashing the ground as well as allowing him to use his most powerful attack: First Impact. The Ruin Strider is Kamen Rider Exode's personal motorcycle that is a modified Suzuki 2011 Hayabusa. The bike's official name is AP-001. It is programmed with an advanced AI to recognize the user of the Exode Driver. Jason can utilize the motorcycle when not in his Rider form. However, in the Rider Mode, it acts as a supplement for Exode to enter Calamity Visage. The machine transforms into a bulky armor with a gatling gun-arm and a cannon-arm. The Raze-Cannon is a photon-based cannon that fires a large, single shot. It also doubles as an rocket launcher. It attaches to the arm in place of the Strife-ARM. The HAVOC-Vulcan Cannon operates similar to a M61 Vulcan, releasing special 20mm rounds at an extremely high rate. It's attached to the other arm and is used for barrage tactics.